Advance directives are documents that express your wishes for medical care in the event of a medical emergency where you can no longer speak for yourself. These documents can also express what should be done with your body after death. Get a checklist that guides you through each step of the process. 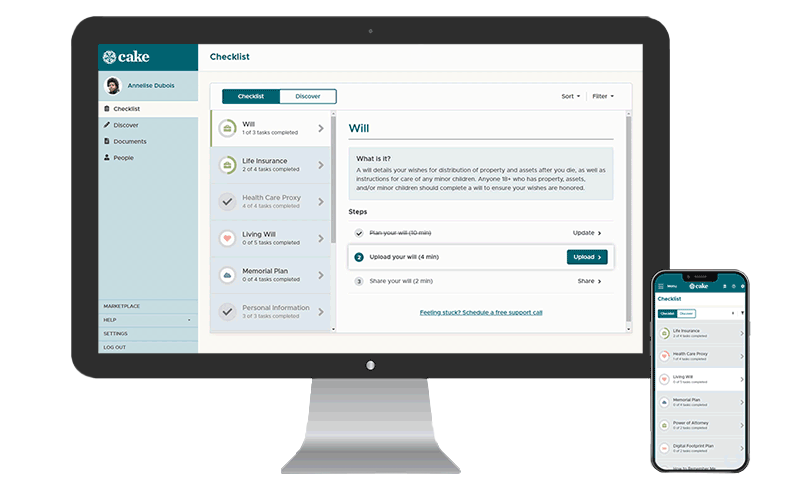 Take care of healthcare, financial, funeral, and legacy planning in one place. Create and upload documents that express your final wishes —then share 24/7 access with loved ones. A Health Care Proxy form lets you choose a person (or persons) you trust to make medical decisions for you if you can’t speak for yourself. Not sure who to choose for this critical role? Read our article about how to choose a good health care proxy first. A Health Care Proxy is sometimes referred to as a Healthcare Power of Attorney, Medical Power of Attorney, Healthcare Agent, Healthcare Surrogate, Healthcare Representative, or Healthcare Attorney-in-fact. It’s important to make sure these preferences are known to 1) make sure your wishes are honored and 2) reduce conflict and guilt among your loved ones if tough decisions need to be made someday. Read more about Living Wills to get a better understanding of how they protect you. Important: Not all state-recognized Living Will documents provide you with enough options to express detailed wishes for end-of-life care. We strongly suggest supplementing your Living Will with a more detailed advance care plan from Cake. While this extra layer of planning may not be legally recognized, it can be immensely helpful for your health care proxy, family, and care team to have a more comprehensive understanding of your end-of-life care wishes. Create a free Cake plan. Who needs a Living Will? Needs 2 witnesses not listed as HCPs (witnesses must be 18+). Who needs a copy of your Living Will? Distribute copies to your physicians, your lawyer, and the person(s) you name as your Health Care Proxy. Keep a record for yourself, too. If you use Cake for your end-of-life planning, you can upload a copy to the Documents section of your account for safekeeping and sharing with your key people. Don’t have an account? Create your Cake account – It’s free. Organ donation is a meaningful way to leave behind a legacy. If you would like to be able to donate your organs after you die, click below to register as an organ donor. Create and share a Cake end-of-life plan to tell your Health Care Proxy and family about this preference. On the fence about donation? Read more about becoming an organ donor before you decide. While not an advance directive, this important form allows you to designate specific people that can obtain necessary information about your medical condition. This is especially important in the event of an emergency. Unless these individuals are next of kin and able to be present in the medical facility, doctors are unlikely to be able to update them with detailed information about your condition–especially over the phone. Learn more about the HIPAA release form. Who needs a HIPAA Release form? Every adult, no matter their health status. Parents sending their adult children to college should have their child complete this form to ensure they can obtain critical information by phone in an emergency. Distribute copies to your physicians, your health insurance provider, your lawyer, and any individuals that you have authorized on the form itself. Keep a record for yourself, too. If you use Cake to do your end-of-life planning, you should upload a copy to the Documents section of your account for safekeeping and sharing with your key people. Don’t have an account? Create your Cake account – It's free. What is a POLST form? This is a medical order written by your doctor stating what treatments you do or do not want to receive if you are nearing the end of your life. These forms cover decisions like whether or not to administer CPR, use of breathing machines, and if emergency personnel should take you to a hospital or not. This form is sometimes referred to as a Medical Orders for Life-Sustaining Treatment (MOLST). Doctors can help frail or seriously-ill people complete these forms. These forms also require a doctor’s signature to be valid. Speak with your doctor about completing a POLST form to record your preferences. Learn more about these forms from POLST.org. Request a completed, signed copy from your doctor. Make sure your health care proxy has a copy and that your family is aware of the document. Provide a copy to any health care facilities where you regularly receive care. Use Cake to store this important end-of-life document and share secure access with your family. Create a free Cake plan. A comprehensive end-of-life plan should also include documents that express your wishes for legal, financial, funeral, and legacy decisions. Cake is a website that helps you plan for everything your loved ones will need someday. Get a personalized checklist to begin building a comprehensive plan you can share with loved ones. We hope you have found this resource helpful! If you have questions or comments about any of this information, please reach out to us at support@joincake.com. Facebook. This link will open in a new window. Twitter. This link will open in a new window. Linked In. This link will open in a new window.